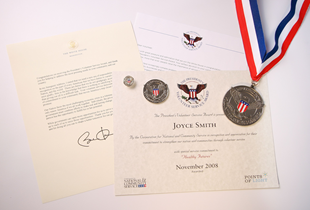 I was talking with a "new" friend this morning and realized I haven't done a post about the President's Volunteer Service Award. I've been tracking for 2 years, but haven't said anything about it here... shame.on.me! Anyway, there is a program for people from the age of 5 on up to earn a President's Volunteer Service Award. You have to be volunteering or working with a Certifying Organization, but a lot of Girl Scout Councils are Certifying Organizations or can easily become one (encourage them politely). Basically, track the hours your girls are doing service projects, volunteering at events, and any service activity. 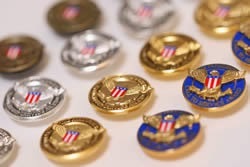 Each age group has a different amount of hours they have to complete to earn the award, but for the little girls it isn't that much (http://www.presidentialserviceawards.gov/the-award) and they probably have earned it and didn't know. Why would you want to do this? Well, they can earn a pin, certificate, and letter from the President thanking them for the volunteerism. That's pretty cool! You can set up an account online and it's easy to enter your hours. Talk with your Certifying Organization and get their Record of Service Key. You'll enter that on your profile and your name with hours will show up in their account, so they can certify hours. Our Service Unit does this for us (because I went through the training to become a Certifying Organization). We do ask troops to pay for the awards for their girls, because we have a lot of girls in our Service Unit and can't afford to purchase the awards for everyone. Now, over time, your hours will all start to pile up if you do this for years. Once you hit 4,000 hours (It sounds like a lot, but it isn't), you earn the Lifetime Achievement Award. It's very pretty and very cool. Anyway... check out the site and check with your Council to see if they are or would become a Certifying Organization. Also, don't forget to track YOUR hours... Leaders, Co-Leaders, helpful parents, anyone that volunteers can track their hours. Even if it isn't enough in one year to get ana award, those hours add up over time and you will be surprised. What I tell my new leaders is that "Track your hours, but don't let that convince you to quit!" HA! Seriously... it's a bit crazy when you see how many hours you put in. I had over 850 hours last year... in one year... but, I got a ton of warm fuzzies in return!